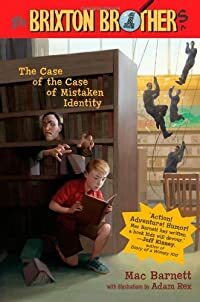 The Case of the Case of Mistaken Identity by Mac Barnett: Synopsis and Online Purchase Options. Synopsis (from the publisher): Steve Brixton always wanted to be a detective … until he found out he already WAS one. It all starts here: The thrilling story of Steve Bixton's first case. Our hero has a national treasure to recover, a criminal mastermind to unmask, and a social studies report due Monday — all while on the run from cops, thugs, and secret-agent librarians. Since when can librarians rappel from helicopters? Does Steve have any brothers or sisters? If not, then why is this series called The Brixton Brothers? You will solve all these mysteries and many more by the time you finish The Case of the Case of Mistaken Identity. We think you'll agree: Steve Brixton's first adventure is his best adventure yet.